As a DAA member, you can use the links below to access the discount codes and links for events, conferences, research and more from around the globe. More are added regularly, and the events are listed in our newsletter monthly. Be sure to check the DAA events calendar for additional events and conferences that DAA has negotiated a member discount for. The DAA is pleased to extend a 20% discount off the registration fees for groups of 5 or more from DAA Corporate Member Companies. DAA members receive a 20% Discount on the Essential Series at eMetrics Summits! The DAA Essential Series are interactive, discussion-based learning opportunities built around the concept of critical thinking – the evaluation and reflective examination of data. The goal of these sessions is to help creators and users of digital activity reporting generate analytical output that enables new insights, and then use these insights to drive positive business change. These classes are non-technical / not about the tools; some experience with basic web analytics reporting is recommended. Put YOUR brand in front of the digital analytics community while maximizing your ROI. DAA has a variety of benefit-rich sponsorship opportunities to help you reach a targeted audience of digital analytics professionals. The Digital Analytics Association has more than 4,800 members and another 8,000+ name opt-in email database.. Our members are decision makers and influencers in this important and growing space. Contact us today to set up your sponsorship package to be front and center of the analytics community! Symposia are great ways for your company to be introduced to a wide spectrum of professionals and ideas across the analytics industry. 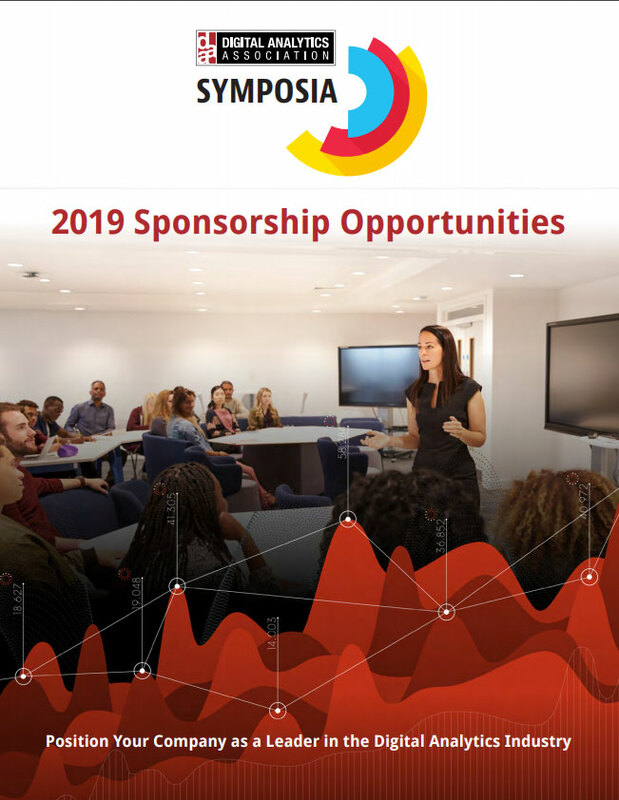 Five to ten times each year in major cities across the US, symposia bring together digital analytics, marketing and business professionals from throughout the area for a day of learning, professional development, and networking. Don't miss an opportunity to take part in a sponsorship that has proven to be productive and beneficial. View the sponsorship opportunities prospectus to learn more. Contact us today to craft a sponsorship package that meets your needs.
" Dollar for dollar, we generate more business from DAA Symposia than from any other event." The OneConference, DAA's first annual conference, will feature 2 days of groundbreaking educational sessions, networking opportunities, and the annual Quanties Awards – all happening together at ONE conference for the first time! With an agenda that includes an engaging roster of analytics leaders, small group workshops, and innovative sessions, this is a sponsorship opportunity you don't want to miss. The Quanties (formerly the Awards for Excellence) are our industry’s way of recognizing the best and brightest individuals in the industry. It is also our thanks to the exceptional groups and technologies that make our work easier and more impactful every day. The Quanties are the most relevant and important award for the digital analytics industry. 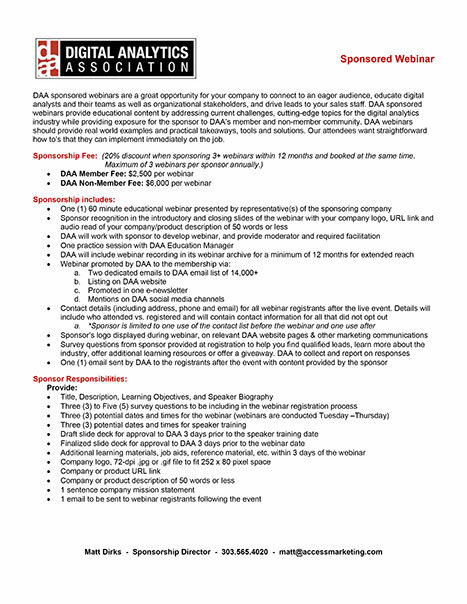 Imagine the impact you could make with a dedicated email sponsored through the Digital Analytics Association, promoting your event or product/services among the DAA's extended community of 12,000+ digital analytics professionals. Sponsored emails are an affordable way to reach this important audience! 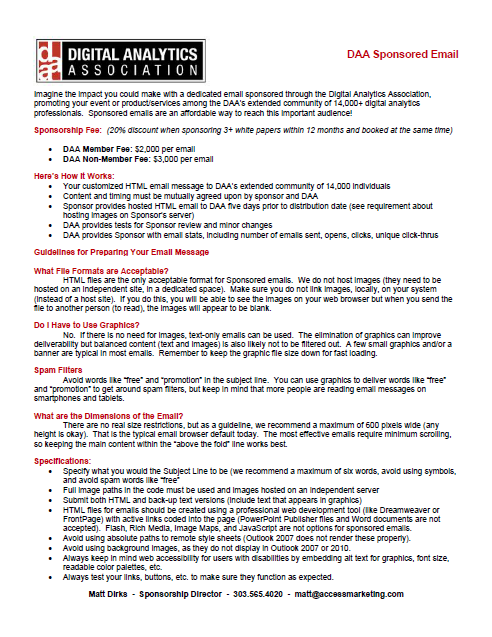 View the Sponsored Email Prospectus to learn more, and contact Matt Dirks to sponsor your email. 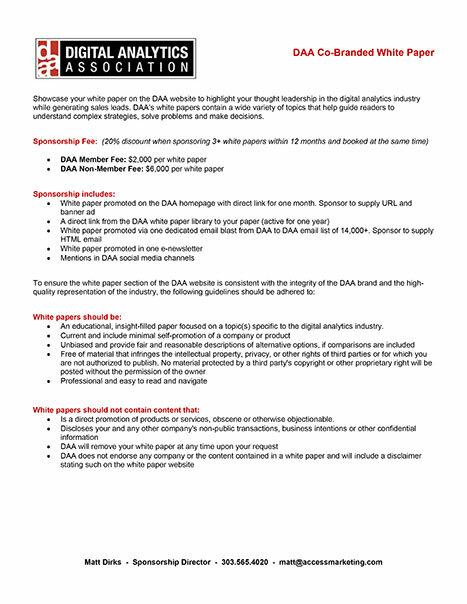 Posting a white paper in the DAA website is an extremely valuable way to highlight thought leadership within your company, as well as an exciting opportunity to showcase your work. View the Cobranded White Paper Sponsorship Prospectus to learn more and contact Matt Dirks to sponsor a co-branded White Paper.
" Our sponsorship of a DAA co-branded white paper was a big success. We received hundreds of clicks via the DAA website and dedicated email, had a conversation rate of almost 50%, and felt the use of the DAA logo on the white paper cover and on our landing page helped to legitimize our approach to digital analytics. We really appreciate the sponsorship and plan to do more with DAA in the future!" DAA sponsored webinars present great opportunities for your company to connect to an eager audience, educate digital analysts, and drive leads to your sales staff. 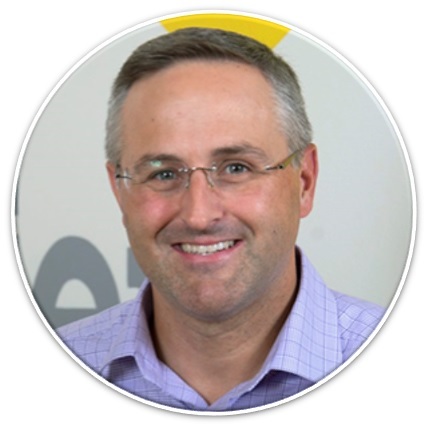 View the Webinar Sponsorship Prospectus and contact Matt Dirks to sponsor a webinar. Showcase your logo, product, service, or event with a banner ad in the Digital Analytics Association Community to be seen in the DAA’s community of 4,000+ digital analytics professionals. Promote your brand in the industry by having your ad or logo displayed exclusively within a specific community (i.e. Member Open Forum) or specific type of community (i.e. local chapters) to be seen in the DAA’s community of 4,000 digital analytics professionals. The ad will be attached to every discussion post and will be showcased in every email sent out by the agreed upon community (daily digest, real time, etc.). The image may link to the website of the sponsors choice. Note: there is only allowed ONE ad per community, ensuring your exclusivity! Contact Matt Dirks to schedule your advertisement. Are you looking for feedback from digital analysts for new product development? Do you want to create a stir about a new product launch? Do you need feedback from our members about how your product is being perceived in the industry? Choose to host a survey or co-host with DAA. We provide the push out to the members, and we drive the participants to your survey tool. Contact Matt Dirks for more details. Being a DAA Trustee Partner is our highest level of engagement. This full-year corporate partnership encompasses every DAA opportunity available for increased visibility and building your company reputation as a thought leader in the analytics space. It is also a cost-effective alternative to sponsorship opportunities separately purchased. Note: There is a limit of only FOUR companies per year at this level. Contact Matt Dirks to customize your Trustee Partnership with DAA. Have a different idea for sponsorship? Tell us - we can create a customized package for you! Contact us and we'll talk! The eMetrics Summit, the Official Summit of the DAA, provides a dialogue between senior marketing executives, expert market analysts, focused technologists, vendors and members of the press about best practices, tools and techniques to appraise and optimize successful marketing programs. For more info on the conference go to: https://www.digitalanalyticsassociation.org/marketing-analytics-summit. DAA members receive a 10% discount on all DA Hub events - the conference and workshop by using the code DAA. DAA Corporate members can take advantage of their free workshop seats by contacting our membership team. DA Hub is not a trade show; it is an experience. Just ask anyone who attended before. No boring presentations. Instead over 40 in-depth round table conversations about the most relevant challenges to you. The DA Hub puts you in the center. Predictive Analytics World is the business-focused event for predictive analytics professionals, managers and commercial practitioners. For more info on the conference go to: http://www.predictiveanalyticsworld.com/. The DAA CWA exam is offered in an Internet-Based Testing format. To improve the testing experience for certification candidates, the CWA exam is now administered on an internet-based testing platform. Get details about application requirements. Apply to become a Certified Web Analyst™. Looking for an Education in Web Analytics? The award winning DAA-UBC Award of Achievement in Web Analytics is now being offered through the University of British Columbia: Get an Overview of the Program. DAA members receive a special member rate. The only educational program of its kind! Get more details and a schedule of programs on the UBC website. Get the discount process ($85 off each course) and code. Register for the Certificate in Web Intelligence – discounted registration to DAA members! As the continuing education branch of the University of California, Irvine, UC Irvine Extension is dedicated to providing a transformative university-level learning experience for our students. We maintain more than 35,000 enrollments each year among our diverse local, corporate, regional, and global audiences, in thousands of exciting course and program areas. For more information, please visit UCI's website about the Certificate in Web Intelligence or download the PDF brochure. Get the discount process (10% off eligible courses) and code. As a DAA member, you can use the links below to access the discount codes and links for events, conferences, research and more from around the globe. More are added regularly, and the events are listed in our newsletter monthly. The eMetrics Summit, the Official Summit of the DAA, provides a dialogue between senior marketing executives, expert market analysts, focused technologists, vendors and members of the press about best practices, tools and techniques to appraise and optimize successful marketing programs. For more info on the conference go to: http://www.emetrics.org/.